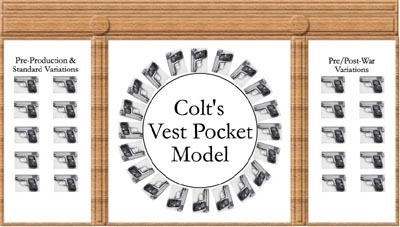 Pictured below is our award winning display of Colt Model 1908 Vest Pocket .25 ACP pistols that was exhibited for the first time at the 2000 Annual Colt Collectors Association Show in Reston, Virginia. The display was awarded First Place in the Automatics category and won the highly coveted Best of Show award. 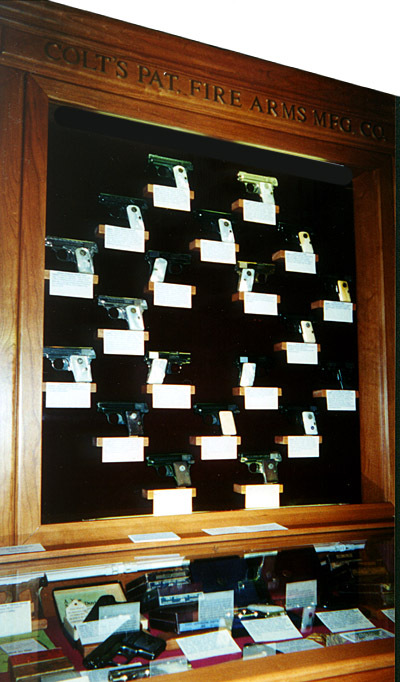 The custom display case contains, with few exceptions, many of the factory variations of the Colt Model 1908 Vest Pocket pistol (Model N) throughout 40 years of production from 1908 - 1948. Aside from the standard blued variations, some exceptional hard to find factory examples (engraved, inscribed, special gripped and special plated pistols) are also presented. Descriptions of several of the pieces appear below under the heading Individual Pieces of Merit. 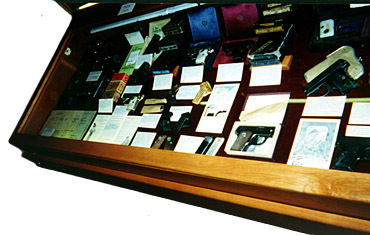 Photos of many of the pistols listed below can be found throughout the site. 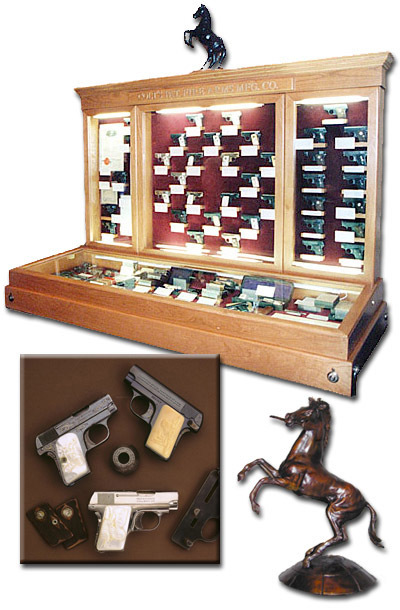 Original factory paper (advertising, original patent documents, factory blueprints and instruction sheets), parts, factory gauges and roll dies, factory accessories (presentation cases, grips, boxes and holsters) are also presented to complete this display. The display was completely custom designed and hand crafted by Gus Glikas and Sam Lisker. From the initial planning to finished product, this project took just over three months to complete. It is a "furniture grade" display constructed from solid cherry of the finest quality. 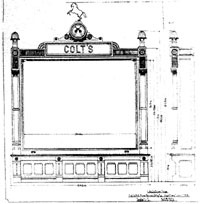 Photos and drawings of the original Colt display cabinets inspired the design for the case and the display. 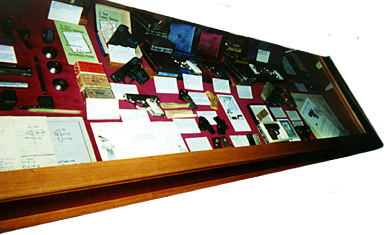 Originally, we planned to have in the center case a circle of deluxe Model N pistols in the style of the Colt Centennial Exhibit (pictured at right). The lack of both time and a design of a secure bracket to hold some of the pistols in an awkward position, prevented me from following through with this plan. 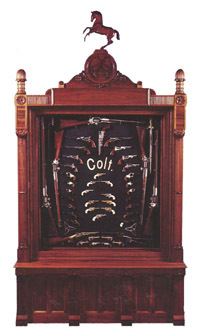 We displayed the pistols in the center case in two concentric circles, but the pistols were mounted on stands that kept them in an upright position. was posted on a free standing wooden sign that was positioned to the left of the display. This was one of the computer generated designs we created when planning the display. Originally, as in our final design, we planned to have three separate upper sections. 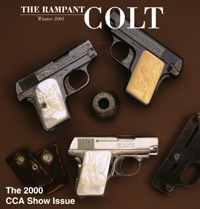 Ideally, the center section was to have a "wheel" of deluxe and unique Colt Model N pistols, but we didn't have a safe and effective way of fastening the pistols at any odd angles, so we opted for a center layout that allowed us to create a wheel of pistols, all in a horizontal position. Model N Unnumbered Factory Cutaway - An early factory cutaway Colt Model N no serial number. An early Model N factory cutaway demonstration model. Blued finish with the earliest slide markings. 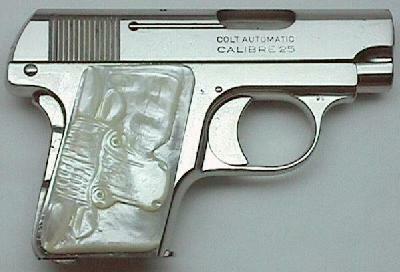 Both sides have been cutaway to expose the internal workings of the pistol. 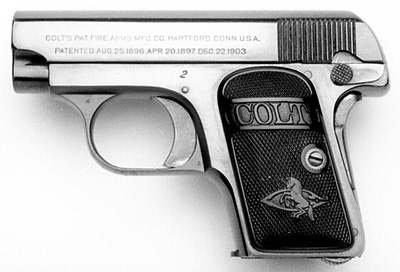 This pistol came from a Connecticut family who worked for Colt for over three generations. Model N Serial Number 2 - Pistol is in near mint condition. Serial number 2 was shipped on November 24, 1908 to Frank A. Schirmer, who at the time of shipment was the Treasurer of Colt’s. Schirmer served on Colt’s board of directors from 1901 until 1921 and was a principal in the original acquisition of Colt’s Patent Fire Arms Manufacturing Company by the Boston and New York financial house of Armstrong and Schirmer in June 1901. Armstrong and Schirmer was a private investment firm affiliated with the George R. Armstrong Company of Boston, Massachusetts. Model N serial number 82838 - Factory engraved, high polish blue finish with Type II mother-of-pearl grips with original Colt box with the correct "PEARL BLUE." and “ENGRAVED.” labels. This was one of two pistols shipped to Browning Bros. Co., Ogden, UT on December 17, 1913. The serial number on the box is 82825, just 13 numbers away from the pistol. 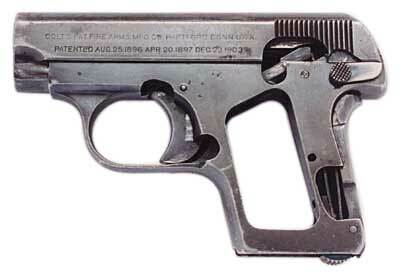 Factory shipping records indicate that 82825 is a factory engraved pistol in the same configuration as 82838. The Colt factory has confirmed that 82825 and 82838 were the two guns in the same shipment. Apparently the boxes were switched either at Colt's before shipment or at the retailer subsequently thereafter. These three Colt Vest Pocket pistols were acquired at different times in the course of collecting. They are all factory engraved examples, in excellent condition and all have different factory finishes with round top recessed medallion mother-of-pearl grips. What's interesting about the set, is that, according to the shipping records, there are no other factory engraved .25s in between the three serial numbers. In other words, they are three consecutive factory engraved Vest Pocket Models. 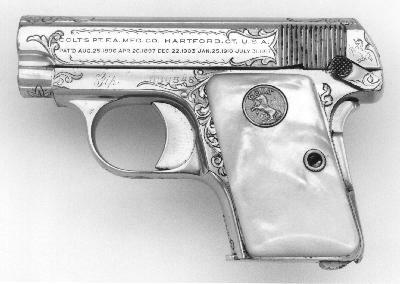 Model N serial Number 125221 – Factory “master” engraved by William H. Gough, blued finish with Type II mother-of-pearl grips. Factory letter confirms these features and indicates that this pistol was a one pistol shipment to H.S. Barton, address unknown, on October 8, 1917. Barton was the vice-president of Glenmore Distilleries in Owensboro, KY. This is one of 49 Model Ns engraved by Gough. Model N serial number 125330 - Factory engraved, nickel finish with Type II mother-of-pearl grips. Factory letter confirms these features and indicates that this pistol was a one pistol shipment to W. Bingham Co., Cleveland, OH c/o J.R. Chadwich on June 2, 1915. Model N serial number 125565 - Factory “Grade 3” engraved, rare silver finish with Type II mother-of-pearl grips. Factory letter confirms these features and indicates that this pistol was one of two shipped to Shelton-Payne Arms Co., El Paso, TX on March 23, 1916. Original factory records indicate that this firearm was processed under Factory Order Number 962 (ex Robert Howard collection). 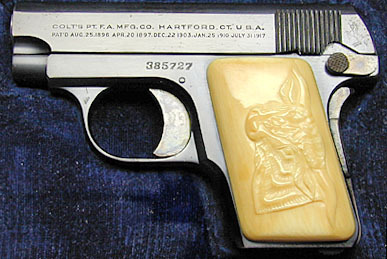 Pistol is accompanied by a deluxe factory presentation case. Silver plating is the rarest factory finish for the Model N. One of 31 silver plated factory engraved pistols. Model N serial number 179276 - Factory inscribed, blued with Type III mother-of-pearl grips. Inscribed “J.S.P.” on left front of receiver. 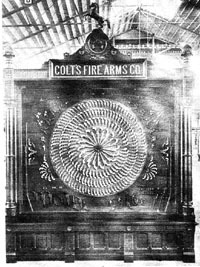 A one gun shipment to Morgan Steadman, Colt’s Patent Fire-Arms Mfg. Company, Hartford, Connecticut on March 19, 1918. The work was processed on Colt Factory Order number 887. 61 Model N pistols were factory inscribed only, 35 of the 61 were blued. This pistol is accompanied by its original box. Model N serial number 271294 - This is one of the original 11 pistols shipped with a pair of “Deluxe” Hand Checkered Walnut Grips. 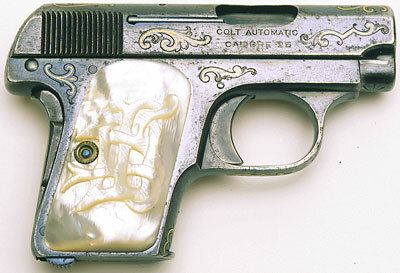 This pistol was shipped to Albert Foster, Jr., Colt’s New York Agent, in a shipment of two guns on June 29, 1920. It was processed on Colt Factory Order Number 2115/2. Accompanying this gun is the original cardboard box that is slightly deeper than the standard factory box. These boxes were routinely used to accommodate the extra thickness of special order grips. There are no labels or markings on the outside of the box to indicate that the pistol is fitted with deluxe walnut grips. 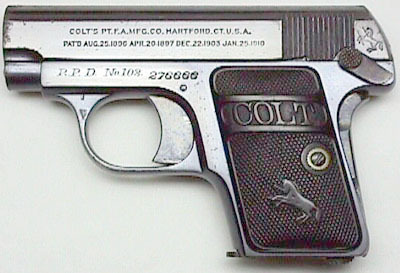 Model N serial number 276666 - Factory Inscribed Colt Model N with Police Department markings. This gun came from a Judge in Reading, PA, so the "R.P.D." is believed to be for the Reading Police Department. This special order Model N pistol was one of 18 shipped 9/16/20, bearing the numbers 101 - 118 in the serial number range 276658-276675, and just one of 31 total factory inscribed police issue Model N pistols. 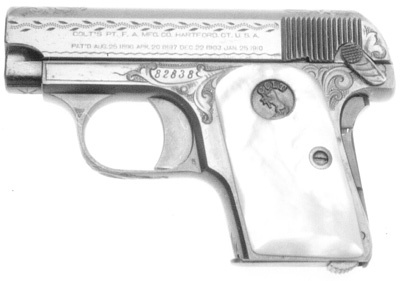 Model N serial number 336546 - Factory engraved & inscribed “Gip” on left side of the receiver in front of serial number, nickel plated finish with Type IV mother-of-pearl grips. Factory letter confirms these features and indicates that this pistol was a shipment of one to J.W. Ferris on October 13, 1923. 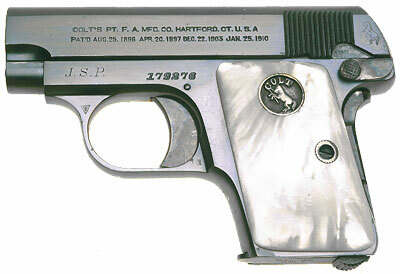 The special order inscription was processed on Colt Factory Order Number 7852/1. Just six of the Model N pistols produced exist in this factory configuration.